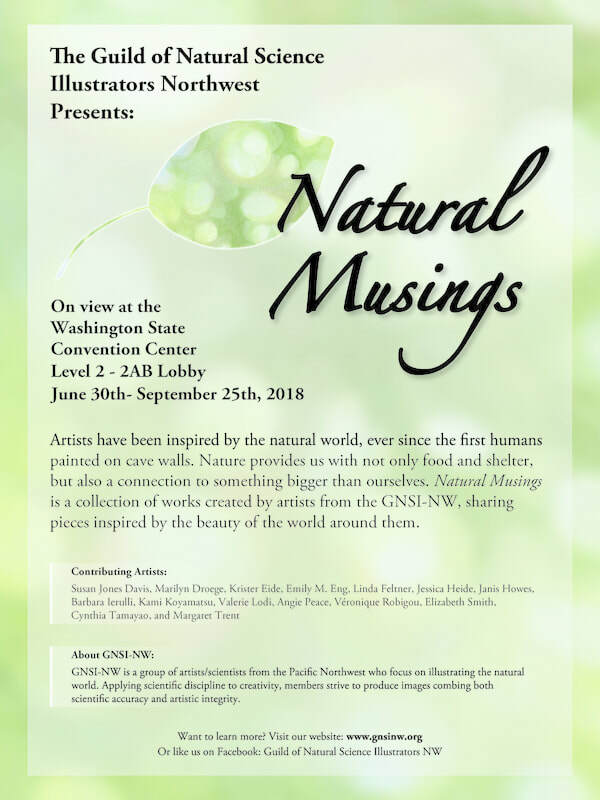 The Guild of Natural Science Illustrators Northwest will be mounting a juried exhibition at the Washington State Convention Center from June 30th, 2018 - September 25th, 2018. The exhibition "Natural Musings" will be in the smaller space on the second level and the number of works will be limited to 30 to 40 pieces. If you are interested in helping to organize this exhibition please contact Barbara Ierulli via the contact form below. Seattle, Washington from June 29th through September 26th, 2018. 2018 to March 12, 2018. Entries will then be forwarded to the jurors for consideration. contribute towards the printing of informational posters for the exhibit space and brochures. This will likely be in the ballpark of $15. - $20. each. Notification: Members will be notified of acceptance during the first week of May 2018.
of from 20-30 works depending on sizes of selected pieces. time frame of the exhibition. responsible for any loss, damage, or stolen works. entry form for the duration of the exhibition. I would like to help with this exhibit or am interesting in more information.